Purchase a minimum 4-night stay at Aulani, A Disney Resort & Spa, you'll get the 4th night free* - including breakfast daily for two adults at the new Ulu Cafe. Book this offer by March 1, 2014, for stays most nights Jan. 5 – April 7, 2014. More time means you can enjoy more of our newly expanded Resort, including additional dining, shopping and water experiences. And so much is already included in the cost of their stay, including Waikolohe Valley Pools, Aunty's Beach House kids' club, peaceful Ko Olina Cove and family entertainment, such as Starlit Hui show and 'Ohana outdoor movie nights. 4 Nights for the Price of 3 Nights with Two (2) Adult Breakfast per Day promotion for Guests who stay four or more consecutive nights all between January 5 and April 7, 2014. The free night savings is distributed across total room nights and is reflected in a reduced nightly rate, based on the non-discounted rate. Must book between October 2, 2013 and March 1, 2014, inclusive. The number of rooms allocated for this offer is limited, and room availability may vary by dates of stay. 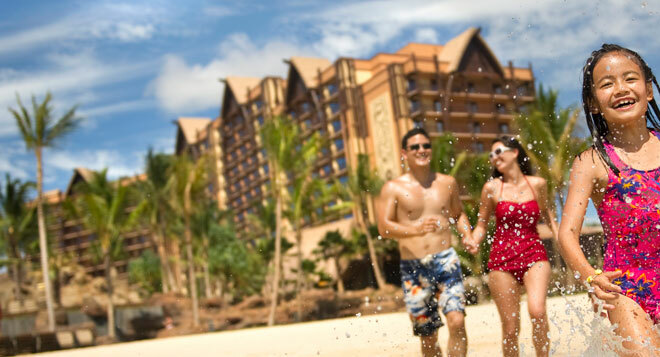 Package includes two (2) Aulani Adult Breakfasts per room per night of your package stay. Breakfast is only redeemable at Ulu Cafe during normal breakfast operating hours and includes one (1) entrée and one (1) of the following nonalcoholic, non-specialty beverages: regular coffee, tea, fresh fruit juice, fountain beverage, hot cocoa or milk. Breakfast entitlements may not be redeemed for cash in whole or in part, sold separately, transferred or refunded. All entitlements will expire at midnight on package departure date. Four Nights for the Price of Three offer excludes Resort fees and taxes. Not valid in combination with any other discounts or offers. Offer excludes suites and 3-bedroom Grand Villas. Additional per-adult charges may apply if more than two adults per room. Limit two rooms per reservation and subject to room occupancy limitations. Advance reservations required. Subject to additional restrictions and change without notice. Contact Only WDWorld Travel to make reservations at Aluni or to get more information.